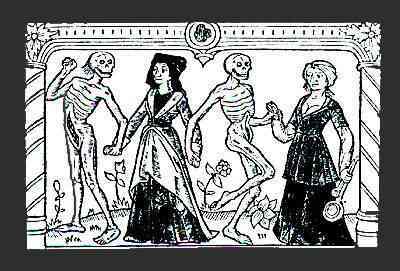 En 1491 apparaît la danse macabre des femmes, venant compléter les diverses publications de la danse des hommes parues quelques années plus tôt. Illustrant un poème de Martial d’Auvergne, en circulation depuis 1482, c’est d’abord une contrepartie exacte de cette dernière, la Reine remplacant le Roi, l`Impératrice l’Empereur, etc... Au fil des rééditions cependant s’ajouteront d’autres gravures dont le total sera finalement de 21. 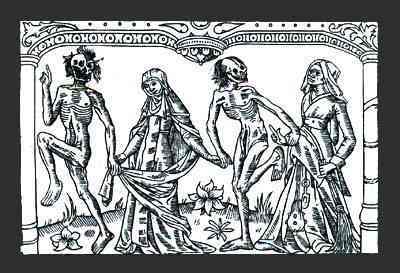 Avec l’amélioration des techniques d’imprimerie (on délaisse le bois comme matrice pour reproduire les images), la dernière version de la dance macabre des femmes sera enluminée et riche en couleur. Le poème décrit les femmes comme étant vaniteuses et avares, possessives et matérialistes. On les voit bourses à la ceinture, parées d’amples costumes et de divers bijoux. Chacune est prise au dépourvu par l’apparition subite de la mort et la plupart discourent sur ce qu’il leur a été promis mais qu'elles n’auront point. Dans le livre enluminé, le style vestimentaire laisse croire que les modèles proviennent de la cour, le dessinateur étant probablement un familier de la noblesse. Le rôle des femmes change en cette fin du 15 ième siècle et l’évolution sociale met de l’avant certains modèles féminins plus raffinés. Dancing, I come to grab you. Today you will be put in the ground. 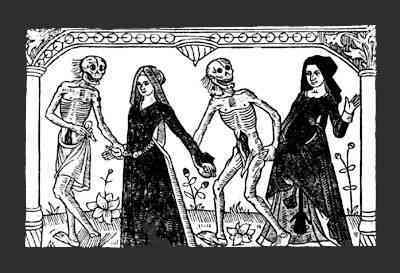 Death never comes at your pleasure. Joy flees like fire on straw. And left me to the trade. I would never have been found like this. The end follows the beginning. You have to account for your deeds. For the poor, you will be ashamed. Except by steps of charity. Everything you do is counted there. Who will help her do it up right. Oh ! I will be leaving without doing anything. I wouldn't know how to keep quiet. And he hates hypocrites above all. Like some nuns, in high collars. Before God and His company. As the priests go to Communion. Between my arms, when I breathe. This child is dying of plague. Sudden death is a great pity. One may not have an hour or a half hour. 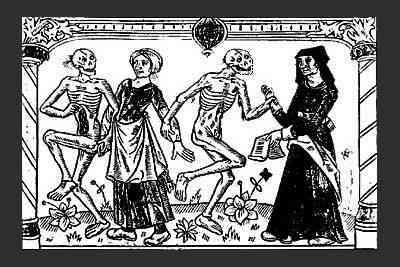 The macabre dance of women appears in 1491, supplementing the later publications of the dance of the men that appeared a few years earlier. Illustrating a poem of Martial of Auvergne, in circulation since 1482, it is initially an exact counterpart of the original, the Queen replacing the King, l`Impératrice the Emperor, etc... From reprint to reprint other engravings are added, finally totalling 21. 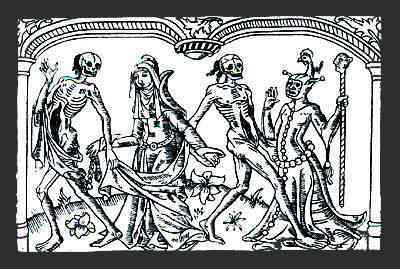 With the improvement of printing techniques (one forsakes wood for metal to reproduce the images), the last version of the macabre dance of the women will be hand-painted, enluminée, and reproduced rich in color. The poem describes the women as being vain and miserly, possessive and materialists. They are seen with purses on their belts, dressed in elaborate costumes and wearing jewels. 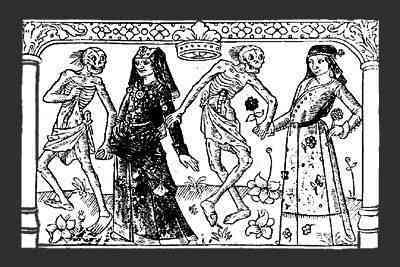 None of the figures knows how to react to the sudden appearance of death and mainly they discourse on what was promised to them but now they will not have. In the hand-drawn book, the vestimentary style lets one believe that the models come from the court, the artist probably being more familiar with the nobility. The role of the women changes at the end of the 15th century and the social evolution produces more refined female models.